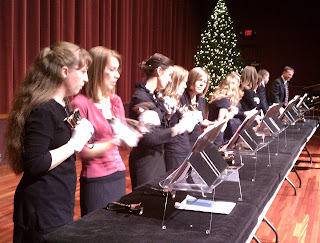 I took some pretty horrible pictures of the bell choir with my new phone. I really wish I had known how to adjust the white balance before I tried taking pictures. Luckily, we sounded a lot better than my poor photography skills made us look. We played for more than a thousand people Friday night. 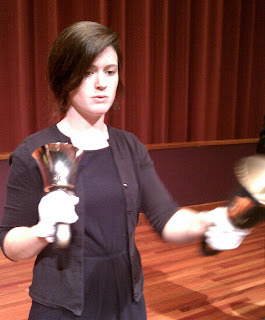 Yes, that many people love the hand bells, especially little kids. It's not really Christmas until you've heard a bell choir. 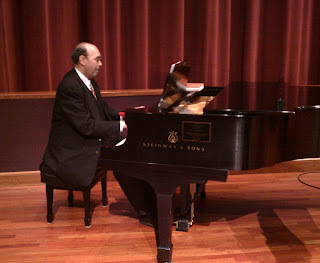 Our accompanist is totally amazing. I wish I could play the piano like him. Check out that ringing action. That form, that determination, that skill. A PR professional, music snob and internet junkie, I spend way too much time reading and not enough time writing.